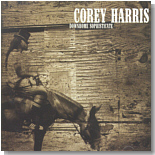 Acoustic blues guitar wizard Corey Harris is never afraid to push the envelope, forging new sounds with traditional blues. His newest album, Downhome Sophisticate, is this month's Pick Hit. This month's Surprise pick comes from Oregon, and the incredible guitar picker David Jacobs-Strain. You won't believe this youngster's playing until you hear it! One of the men behind the scenes in the rich history of New Orleans R&B is Wardell Quezerque. Many of the classic recordings he produced in the early 1960s are included in a new collection, reviewed in this month's Flashback. This month's What's New section, in what may be the largest edition of Blues Bytes to date, include new releases from Jimmy Thackery, Joe Louis Walker & Otis Grand, Coco Montoya, Will Derryberry Band, Vernon Garrett, Chuck Roberson, Boo Boo Davis, Etta James, Syl & Jimmy Johnson, Nicole Fournier, Louisiana Red, The JW-Jones Band, and more.